SHE'S sure to get his attention now - for better or for worse. 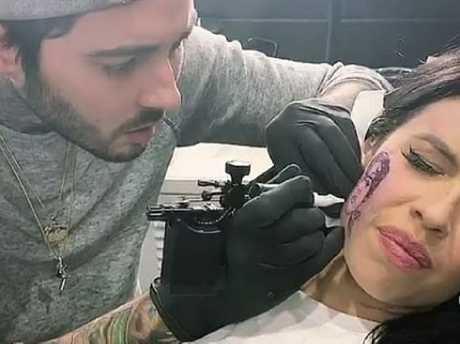 New Zealand-born, Gold Coast-raised singer Kelsy Karter has boldly declared her love for Harry Styles by getting a tattoo of the pop star's face on her right cheek. The 24-year-old posted a photo of her freshly needled Harry Styles tattoo on Instagram on Sunday with the following parental advisory: "Mama, look what I made me do." 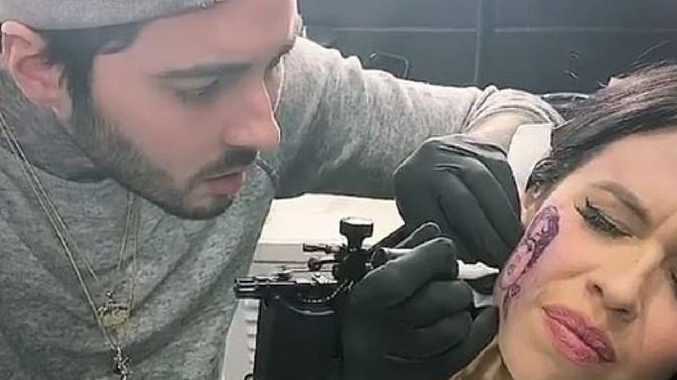 LA-based tattoo artist Romeo Lacoste is taking credit Karter's extreme about-face. 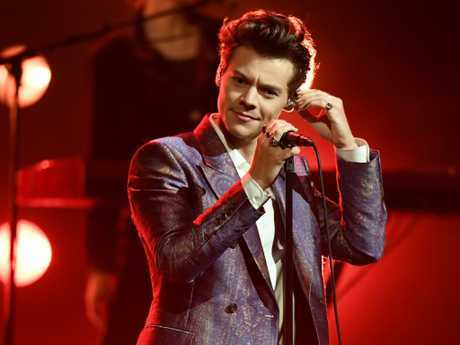 Her 44,000-plus Insta followers suspect it was based off a promotional shot from the former One Direction frontman's self-titled 2017 solo album, which features Styles in a soaking wet, baby blue velvet suit. While it's unclear if these two have even met, Karter reportedly wrote a song for Styles' former bandmate Zayn Malik, who purchased the track but is yet to release a recording of it. Some fans are speculating the tat is an elaborate hoax; little more than a big attention grab for the fledgling pop star. "What I love about him from a professional standpoint is that he was the poppiest of pop stars, and then he went off on his own and made a classic rock album. "For someone like me who wants to live in that world who hasn't been in a boy band, he has opened the door for me. He's introduced the kids to the kind of music I want to make," she said. "For that, I'm really grateful. I also just want his career. I feel like I'm a female version. I actually moved to America to act, and music became my main thing. Rock 'n' roll is my passion. I really want to work with him. Let's work, Harry. Where you at? Mark my words: I'm getting a song on his album." Karter released a new single, Catch Me If You Can, in December. Just one question: fake or not - does this even look like Harry Styles?